The Ely Stage Stop & Country Museum presents the next Living History event on Saturday, July 25. This particular event will welcome local historian and long time Lake County resident, Mike Salter. Salter moved from Nebraska to Lake County in 1955. 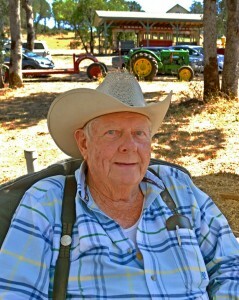 He was part owner and manager of Colonial Title Company in the counties of Lake, Colusa, and Glenn. Salter will be available to the public in the Ely main house starting at noon to visit with guests and answer questions. Topics will include the early days of Buckingham Park (formerly Buckingham Peninsula), the early days of television in Lake County, and fish planting activities in Clear Lake. Home to the Lake County Historical Society, the stage stop is located at 9921 State Hwy 281 (Soda Bay Road) in Kelseyville, near Clearlake Riviera, just north of Hwy 29-Kit’s Corner. Current hours of operation are 11:00 a.m. to 3:00 p.m. each Saturday and Sunday. Living history events are held on the fourth Saturday of each month from noon until 2 p.m. Fiddlers’ Jams occur the first Sunday of every month, again, from noon until 2 p.m.